Farro, an ancient relative of modern wheat, was once called “pharaoh’s wheat,” since it’s been around since the pyramids were still under warranty. It’s kept its appeal across much of the world through the intervening centuries, especially in Italy and the Middle East, but it’s only caught on in North America relatively recently. 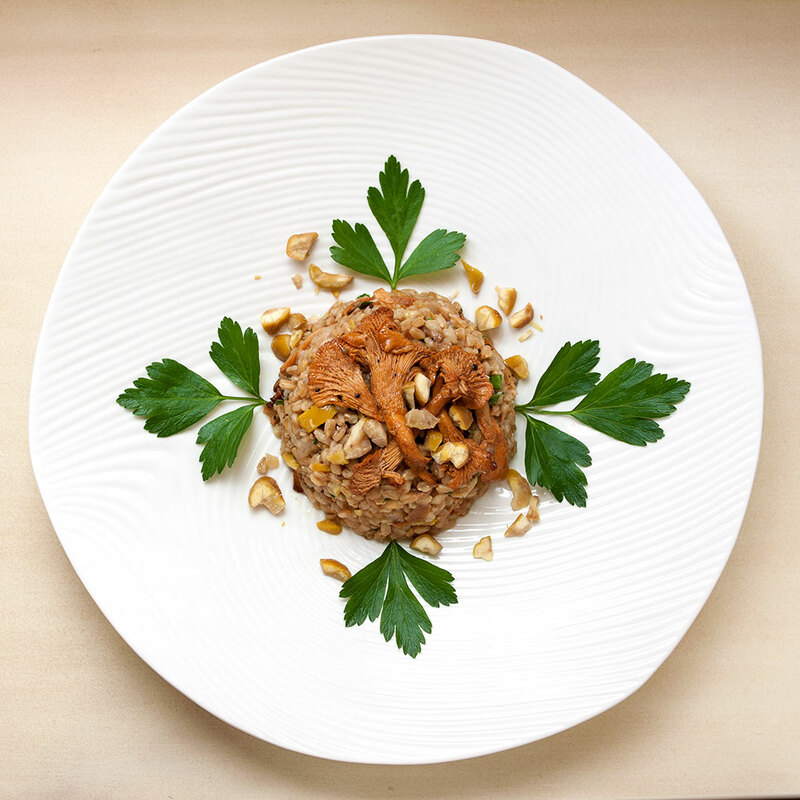 Once considered rather exotic, delicious farro now pops up regularly on restaurant menus and can usually be found in well-provisioned grocery stores. Farro’s wholesome grain-like flavor makes a pleasant change from the usual rice, potatoes or pasta. Part of the ancient grain’s appeal lies in its substantial, pleasantly chewy texture, which makes it a good choice for hearty side dishes and salads like this one. There are many varieties of fresh wild mushrooms available this time of year, but we chose chanterelles, the “queen of the forest,” for our salad. 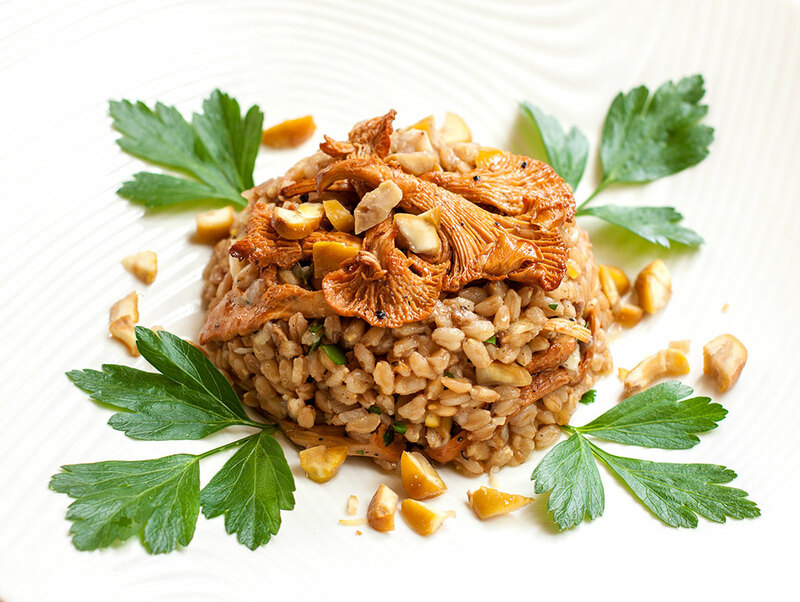 The warm, woodsy taste of chanterelle mushrooms is the perfect complement to the earthiness of farro and the sweetness of the chestnuts. 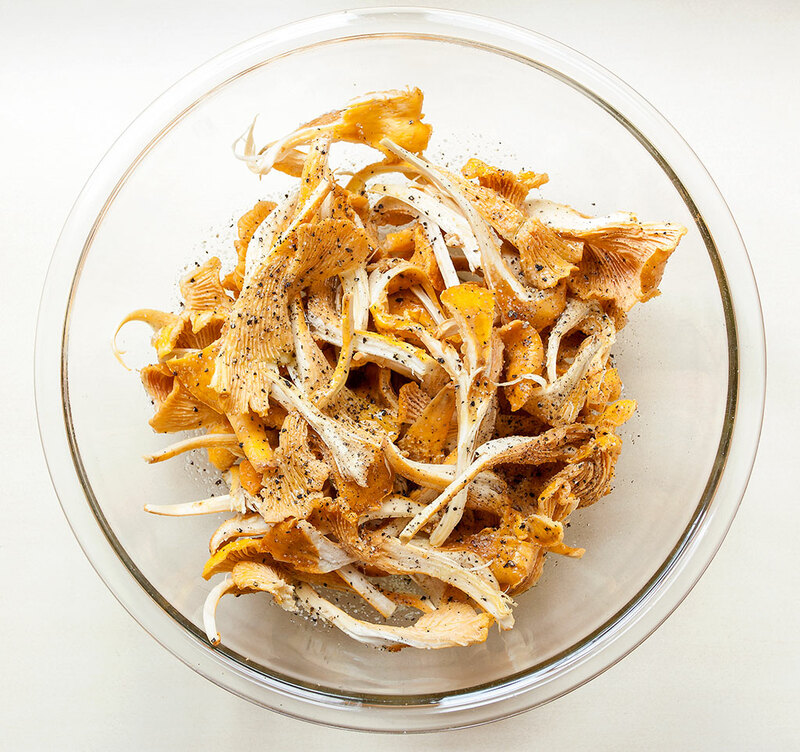 The chanterelles are roasted in the oven, rather than sauted, a technique that enhances and concentrates their flavor and aroma. Like many of our favorite dishes that feature mushrooms, this one includes both fresh and dried varieties for an extra boost of mushroom flavor. Dried mushrooms can sometimes be intense, but here the dried porcini are subtle, adding depth and complexity without overpowering the other ingredients. The final touch? A simple vinaigrette of aged sherry vinegar and good extra virgin olive oil, perked up with the lively bite of fresh shallots. Rinse the farro well under cold running water. Soak in 7 cups cold water in a large bowl for 1–2 hours (this will help it cook more evenly and in less time). Preheat the oven to 425°. In a bowl, toss the mushrooms with 2 tablespoons of the oil and season with salt and pepper. Spread the mushrooms on the baking sheet and roast for about 20 minutes, or until tender and browned around the edges. Place the chestnuts in a small saucepan and add 1-1/2 cups of the chicken stock. Bring to a boil, then reduce the heat to medium low. Simmer until tender, about 20 – 30 minutes, depending on size. When the chestnuts are easily pierced by a sharp knife, remove the pot from the heat and drain the nuts, reserving the hot stock for the next step. Allow the chestnuts to cool slightly, then chop coarsely and set aside. Add the dried porcini to a small bowl and pour over the reserved hot chicken/chestnut stock. Let stand for 15 minutes or until the mushrooms are soft and pliable. Strain out the porcini, again reserving the soaking liquid, and rinse the mushrooms under running water to remove any residual grit. Squeeze gently, then coarsely chop. Carefully pour off the flavorful reserved soaking liquid into a clean bowl, making sure to leave any dirt or grit behind. In a small bowl, cover the finely chopped shallot with the sherry vinegar and let stand for 10 minutes. Add the thyme and whisk in 1/2 cup of the olive oil. Season with salt and pepper. Heat the remaining 2 tablespoons of olive oil in a large pot. Add the onion and garlic and cook over moderate heat, stirring occasionally, until they soften and become translucent, about 4 or 5 minutes. Drain the farro and place into the pot with the onion & garlic. Add the chopped reconstituted porcini and reserved soaking liquid, 3 cups of stock and the bay leaf. Bring to a boil over medium-high heat, then reduce the heat and simmer gently, stirring occasionally, until farro is tender but still al dente, about 18 minutes. Turn off heat and allow to stand for 10 minutes. Drain any remaining liquid, reserving for other uses, and discard the bay leaf. 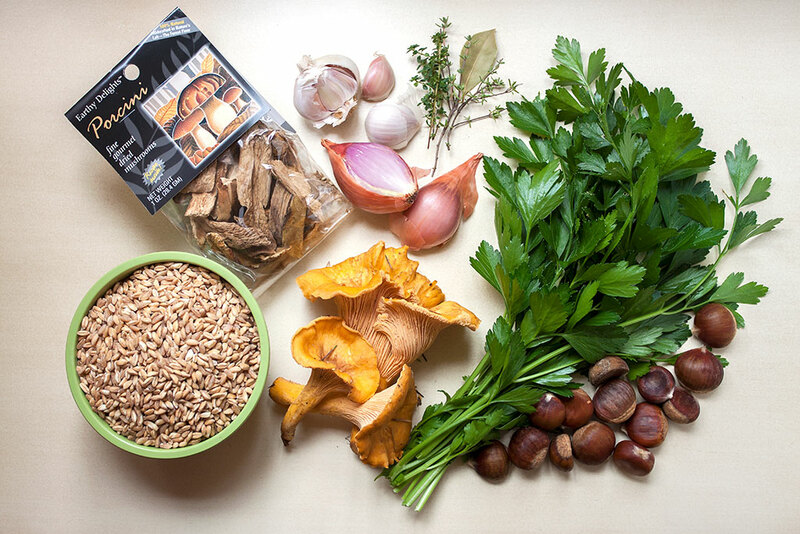 Return the farro to the pot and toss with the chestnuts, roasted mushrooms, sherry vinaigrette and parsley. Season to taste with salt and pepper. Remove to a serving bowl and enjoy! Delicious warm or at room temperature.